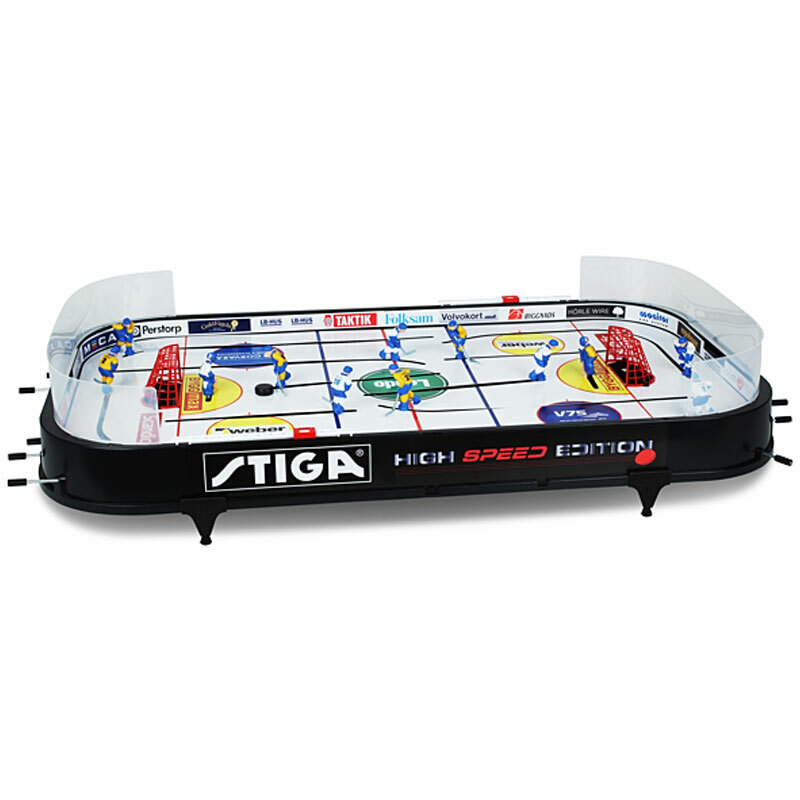 STIGA ® High Speed Edition, the newest version of the classical Hockey Game. Brand new ice sheet technology makes the game faster. Action on the highest level. Fun for all the family!! Teams playing: Sweden - Finland. Goal counter, Plexi, Puck ejector. Dimensions: 88cm x 48cm x 8cm (L x W x H). Great game for all age groups. We bought this for Christmas and it's been fun for all the family. Delivery was good and the game was easy to assemble. It seems well made. Would recommend. This hockey game table was bought as a birthday present for my 9 year old, hockey mad, son. And I must say it is fantastic. We have had a few different games tables, including air hockey and a larger rod based hockey game, but this is the "dogs". Amazingly well built and with spares available it will last even if there is a breakage. Good work Stiga & Thhanks Newitts for stocking them in the UK. Bought this for my 8 year old for Christmas as I wanted to buy something that didn't have to do with the TV. Computer or iPad. Arrived within a couple of days - well packed. Very easy to set up. Quality of this product is outstanding. Had a similar version when I grew up in the States. This one blows it away. Not only does my son love to play it but so does his sister and older brother. Would highly recommend for something different. 5 out of 5 A fantastic addition to any competitive home! Living in a student house, there is always room for one more distraction from work. The STIGA high speed game is a brilliant one. The game takes only ten mins to set up and can be dis-assembled easily for storage. Admittedly, the game is rather tricky to get the hang of at first, our early games were rather slow paced affairs. But you will quickly improve, and the rivalries amongst friends will intensify as your games increase in speed. Due to being an unfamiliar item to most people on these shores, there is also a great social element to the game, every visitor to the house will have to have a go out of curiosity. All in all it is a fantastic game, and offers a nice alternative from the usual table football, especially if you have any interest in Ice hockey. I bought this game for myself but I didn't realise the benefit of getting my 15 yr old son off the X box and computer that this game did. So much fun, designed for an octopus but once you get used to it skilful passes start. Miss your kids? Get this game and conversations begin once more, nephews love it too. Fantastic game and perfect for a group of four. The players are well spaced for fluid non-stop play and there is a great mechanism for recovering the puck from the back of the net which means play is virtually continuous, fast and furious. No surprise this is the official game for rod hockey tournaments all over the world.